The Rugby World Cup has just come to an end with New Zealand the victors. Tesco supported it all the way with their #CelebrateTheNations campaign and asked if I'd support one of the countries with a recipe. Of course I had to support my own bonnie Scotland. They reached the semi-final before going out, so they did themselves proud. I think their best finish was 4th place, but we can live in hope. At this time in year in Scotland it's dark and getting rather chilly in the morning and at night. Everyone is wrapping up in layers. The thick tights and boots are coming out of wardrobes, along with scarves and gloves. There's also a lot of sniffles about, so the perfect time to share a hot toddy with you. A hot toddy is a traditional Scottish hot drink to ease off the symptoms of cold and flu. The honey eases your throat, the lemon adds some vitamin c and the whisky warms and fights of the germs. Well that's what we think and we're sticking to it! 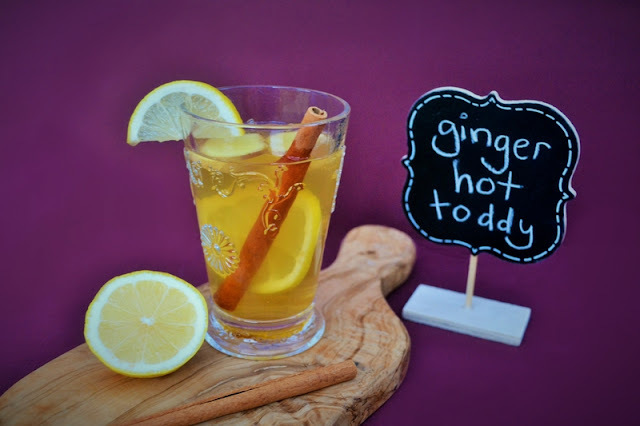 A hot toddy is generally whisky, hot water, lemon and honey. We like adding spices too. I added slices of fresh ginger and a stick of cinnamon, but you could go for nutmeg or cloves for an extra kick of spice. Let it sit a little, so it's not too hot and to give the flavours a chance to develop. Remove any whole spices before drinking. I reckon anyone playing rugby at this time of year would appreciate a hot toddy before they hit the field. Don't you? 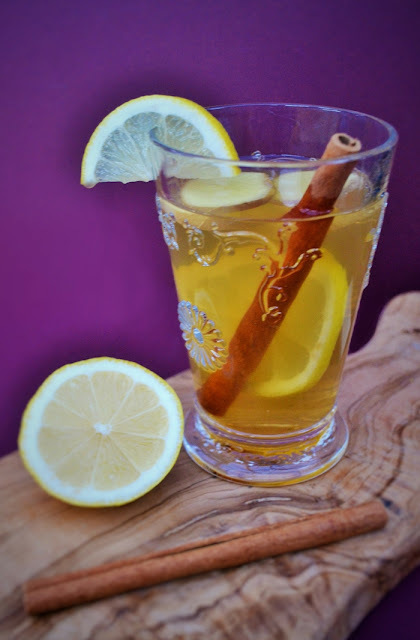 Fresh Ginger and Cinnamon Hot Toddy, the Scottish way to Fight of Colds. 1. Add honey to your tall glass or mug.2. Add a splosh of boiling water to the honey and stir to dissolve the honey. 3. Add the whisky and stir.4. Add the slice of lemon, slices of fresh ginger and a cinnamon stick, then top with more boiling water. Stir it with the cinnamon stick.5. Set aside for a few of minutes to cool a little and for the flavours to develop. Give it another stir then remove the cinnamon and ginger before drinking.6. Enjoy and feel better soon! 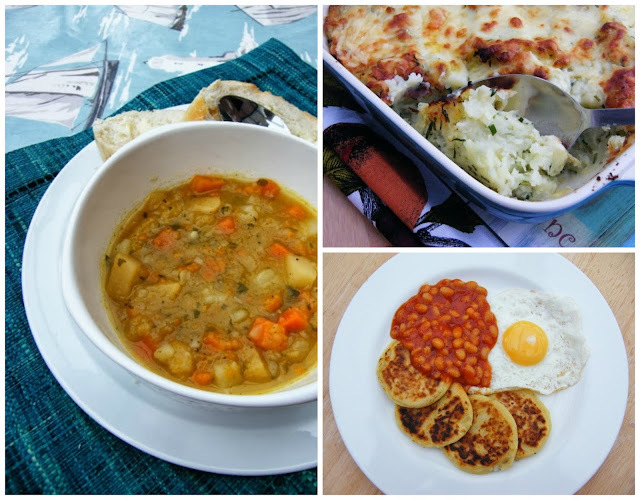 Have my dishes inspired you? Why not create your own culinary masterpiece and #CelebrateTheNations this Autumn? Head to realfood.tesco.com/celebratethenations.html for more recipes. Disclosure: This is a sponsored post for Tesco. I was not expected to write a positive review and any opinions expressed are my own. Great recipe jac.... I think we'll be needing plenty of these to warm up watching Arlo play rugby this season!!!! Take some with you in a flask Katie to keep you warm and why not make a non-alcholic one for Arlo. Just add some lemon or orange cordial instead of whisky. lovely. Hope you are not too cold up there. Love the use of splosh in a recipe quantity! I've never had a hot toddy before but I feel this is the year ti change that. It sounds delicious! Oh yea it is rather good and really warming. Oh I'd bet that the ginger makes it very bracing and does wonders for clearing that cold away! Yes and you're right, I forgot to point out it's antiseptic properties. Yes the lurgy is a sad fact of life. This will definitely perk you up when you are feeling under the weather.